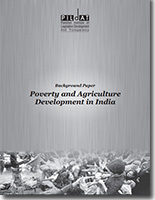 Poverty and Agriculture Development in India is a background paper authored by Mr. Vijay Sardana, PGDM P(IIMA), M.Sc. (Food Tech.) (CFTRI), B.Sc. (Dairy Tech.) PG Dipl. in Int’l Trade Laws & ADR (ILI), Justice (Harvard) Specialized in Bio-economy & Agribusiness Value Chains, Innovation Management & Capacity Building, for the benefit of participants of the Pakistan-India Legislators and Public Officials Dialogue on Sharing of Experiences on Governance and Democracy scheduled to take place on January 24, 2017 in Dubai, UAE.